An 81-year-old great-granny had to curb visits to her son’s grave amid fears that she was putting her own life in danger in the process. Mary Lyon, whose four-month-old baby son, Archibald Shanks, is buried in Old Carriden Cemetery in Bo’ness, now wants those responsible for its upkeep to act. Continual deterioration of the building has seen part of the entry-way ceiling collapse and Mary was afraid it would collapse even further, injuring anyone in the vicinity. Pigeons are also now roosting there, forcing Mary to wade through feet of droppings to reach her son’s grave. Mary said: “It’s distressing enough visiting my son’s grave but I like to feel close to him and this is where I can do that. “To have to navigate my way through pigeon mess and the dangerous entrance makes it all the more traumatic. “Nobody seems to care. You’d think that the final resting place for people would be an area which would be maintained and cared for. Mary’s grandaughter Maresa Brown’s attempts to find an owner were fruitless and, initially, no-one the Journal and Gazette contacted would accept ownership of the ruin either. But as went to press, we discovered that – under an ancient 1925 church act – it was, in fact, Falkirk Council’s responsibility. To get that information, we firstly contacted the Reverend Malcolm Lyon (no relation). He pointed us in the direction of Falkirk Council, claiming that Carriden Church had nothing to do with the dilapidated building. Historic Scotland, which the Church of Scotland suggested as a possible care-keeper. Historic Scotland confirmed that the ruin was a listed building on its register. However, like Falkirk Council, it said it had no responsibilty for the repair or upkeep of the building – despite its listed status. 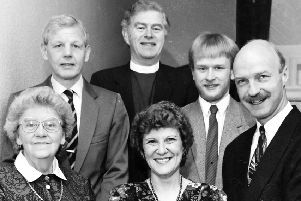 In a bid to resolve the mystery, the Journal and Gazette contacted the Church of Scotland’s headquarters in Edinburgh. Enquiries were made with the legal department which was able to locate the title deeds for the old church. As the Journal and Gazette went to press the mystery was solved. Under the Church of Scotland (Property And Endowments) Act 1925 “the property of any churchyard held by the heritors of any parish vested and transferred to the local council at the date of the passing of this legislation”. A Falkirk Council spokesman said: “It appears the graveyard south of the kirk (and its entrance) is in the ownership of Falkirk Council.